« Suffrage Stories: Where Did Christabel Pankhurst Live In Paris? On Friday 11 April 1913 Percy Lankester, one of Tunbridge Wells’ leading photographers, forsook his studio at 38 High Street and, on a day as cold as that 100 years later, set off with his camera for the Nevill Cricket Ground, a brisk 15 minute walk away. He was on his way to photograph a scene very different from his usual views of the elegant and harmonious streets of Tunbridge Wells. For what he recorded, from several different angles, was the all-but destruction of the cricket pavilion – and the complete destruction of the club’s archives. 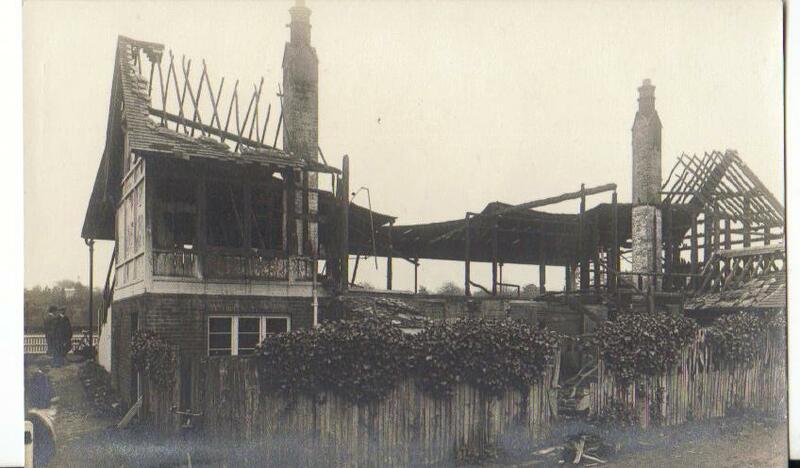 Percy Lankester published his photographs of the ruined Nevill Pavilion as postcards, souvenirs of one incident in Tunbridge Well’s history. The arson attack was ascribed to the action of militant suffragettes – although no-one was ever held responsible. With Mrs Pankhurst on hunger strike in prison, April 1913 saw an intensifying in the WSPU campaign of protest – with arson becoming an increasingly popular weapon. The Nevill Pavilion was one of the first casualties in this new stage in the long fight for ‘votes for women’. Other arson attacks -on churches, houses, railway stations etc – were recorded in other localities by other photographers – who then issued the result, as did Mr Lankester, on a photographic postcard. Such scenes make an interesting sub-genre for the collector of suffragette postcards. This entry was posted on April 15, 2013, 8:55 am and is filed under Collecting Suffrage, Suffrage Stories. You can follow any responses to this entry through RSS 2.0. You can leave a response, or trackback from your own site.